Another British offering from the Gaudeamus label continues to confirm the high quality of music from this country that has remained quite obscure. Goodson's odes are full of patriotic pomp and bluster especially the opening 'Ormond's Glory' which concludes with a wonderful 'Sound the trumpet, beat the drum'. Janus did Ever is shorter but no less intense especially in its central section. Locke's 8 minute Harpsichord Suite provides an instrumental break that is the ideal tonic to Estwick's Julio Festas Referente Luces, an ode filled with pride and nobility, marvelous stuff and thrilling from beginning to end. Blow's Voluntary is another short Prélude to the final ode, 'Brittania' by Aldrich, great stuff indeed although slightly too overboard for my tastes. 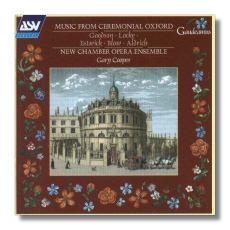 Still, I enjoyed myself immensely whilst listening to this music, which is very well interpreted by the New Chamber Opera Ensemble conducted by Gary Cooper. A genuine discovery then, and one which demands to be heard.